The Replacements – “I Don’t Know” (click to listen or download). The biggest item on the Madison Metropolitan School District Board of Education committee agendas this week is the “Expeditionary Learning Model at Toki Middle School and Timeline” before the Planning and Development Committee (Monday, October 15, 2012, 6:30 p.m. Doyle Administration Building, Room 103, there are Public Appearances on the agenda). The proposal is to convert Toki Middle School from a district school to a district instrumentality charter school. This is the start of a long process of weighing the pros and cons of the proposal, with various decision points along the way. If the proposal gets that far, the final decision by the Board would be in early 2014 and if the vote is for approval the conversion would happen in September of that year. Having first seen the proposal only a couple of days ago, I have many questions, concerns and observations, but am nowhere near having decided whether to oppose this. For the record, that’s exactly where I was at at this point with both Badger Rock (which I did not oppose) and Madison Prep (which I did). Also for the record, I can’t see myself actively supporting any charter school proposal (it could happen, but it is doubtful). Mostly I see charters as a distraction from improving the district schools that will for the conceivable future continue to serve the vast majority of students (see this recent post from Deb Meir for some related thoughts). A desire for Federal money appears to be driving the decision to seek a charter. Note the “do more with less,” and the “need to look beyond the District allocation process” and remember that in the recent past MMSD has not used the full levy authority available and that the administrative recommendations to not use the full levy authority have been accompanied by assurances that the quality of education was not suffering due to the lack of resources. If that was true, then the statements here aren’t. In the bigger picture, with Race to the Top (and the NCLB waivers), we have seen how chasing Federal money has led to less than stellar education policy-making. Much less than stellar. The budget numbers assume maximum Federal Grants. I don’t know if this is realistic. In order to qualify for the maximum, the Charter must have at least 50% free/reduced lunch enrollment. That has been the case with Toki only one of the last 11 years (2010-11). Beyond that, I’m not clear if the maximum grants have changed recently or if DPI awards grants below the maximums, but I do know that no grants given in 2012 were this large. The dollar amounts cited in the proposal are over three times as large as those cited in a previous request. On January 31, 2011 the Board was presented with a funding appeal (apparently directed at private donors) for Expeditionary Learning exploration and implementation at Toki, with a 4 year budget that totaled $310,000. In the pending 2012-13 budget MMSD will provide $60,000 for planning. It would be good to know why the numbers have changed. The proposers are probably correct that MMSD can not fund $975,000 for their purposes, but another $250,000 ($310,000 minus $60,000) over 2-3 years is possible. At this point there is no indication of what the ongoing costs will be. That’s fine, that information is required at later points in the process, but being aware that there may be extra costs that continue after the Federal money goes away seems wise. They appear to be proposing a school that is both a charter and and an attendance area school. On page 13, the proposal says the Charter School students will be “reflective of the current neighborhood,” that “all students within the Toki attendance area will attend,” but also includes references to a lottery to meet numbers. I would assume that some arrangements would be made for attendance area students who do not want to attend the Charter School, who would prefer to have the policies of their school set and implemented by an elected Board of Education instead of a self-selected Governing Board. 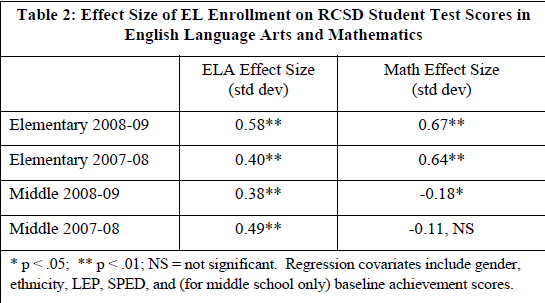 The research cited on Expeditionary Learning is less than convincing. The research citations here seem to come straight from the Expeditionary Learning organization that would be in line to receive most of the $975,000 being requested, so it seems worth looking a bit closer (it is also worth noting that the three studies all appear to have been commissioned by that organization, although I am not 100% sure of that). Another important caveats is that these are all based on standardized tests and those offer very limited insight into school quality. The Rochester study includes two Expeditionary Learning schools. The Genesee Community Charter School, serving grades K-6, with a Free/Reduced Lunch rate of 17%, and 0% student mobility, 18% African American, 9% Hispanic, 2% ELL (can’t find Special Ed numbers). For all these reasons, I don’t see it as comparable to Toki (grades 6-8, not a charter, 48.9% Free/Reduced, most recent mobility factor of 15.8, 28.1% African American, 13.8% Hispanic, 11.5% ELL, 16.4% Special Ed). the other is the World of Inquiry School. This is not a Charter, but it may be a magnet or choice school (there is an “Admissions” page on the website, but the click through ends up at a page that isn’t working). World of Inquiry is a K-8 school, and appears to face similar challenges as Toki, some more pronounced (63% Free/Reduced, 76% African American, 9% Hispanic, 3% ELL). I’ll be returning to World of Inquiry. Statistically significant doesn’t always translate into significance for policy. The next step in the attempts to address this by converting the effect sizes into “implied shifts” in proficiency percentages. 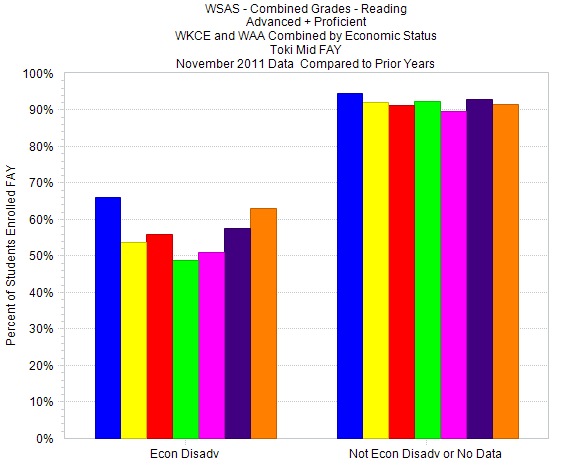 The shifts in some of the categories (the same ones as the above chart) are large — about a 30% gain in proficient students for middle school reading in 2007-9, for example and bigger gains with elementary (along with losses for middle school math — so large that they make me doubt the whole analysis. remember that it did not meet the Department of Education’s What Works Clearinghouse standards. I’ll look closer later and consult with people who know more about quantitative work than I do (as I said at the top, this is going to be a long process), for now I want to keep this in mind and shift to looking directly how middle school students at World of Inquiry have been doing. Note that state proficiency measures vary greatly, according to the NAEP mapping project, Wisconsin’s are lower than New York’s. In every category, World of Inquiry is doing worse than Toki, far worse. This raises many questions about all the promises made in the proposal. Again, much here that doesn’t support the confidence of the citations or tone of the proposal. Note that state proficiency measures vary greatly, according to the NAEP mapping project, Wisconsin’s are lower than Maine’s. Students at King seem to be doing roughly the same as students at Toki, with African American students doing substantially worse. 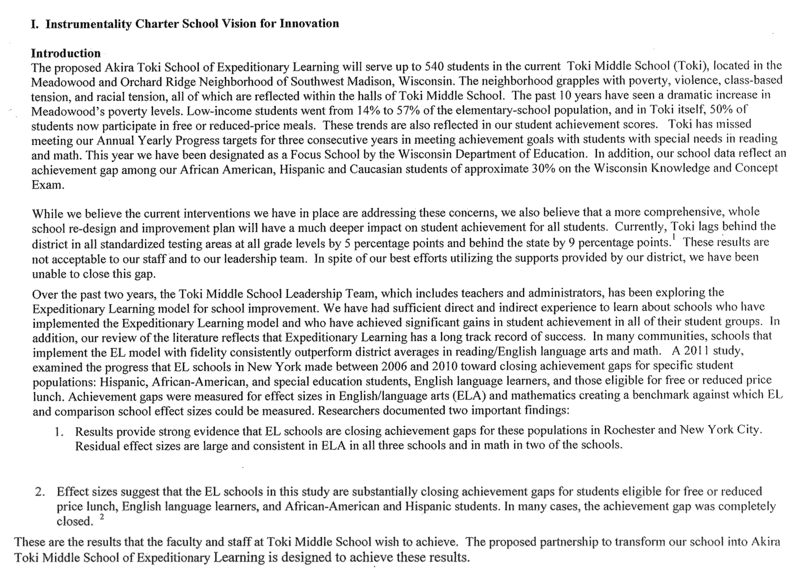 These initial forays into the research and data find little or nothing to support the implementation of Expeditionary Learning (with a charter or otherwise) as the solution to the challenges and struggles Toki has been facing. There is much more to be done before a firm conclusion either way is arrived at. I hope that unlike with Madison Prep, the MMSD administration does their duty to thoroughly analyze the educational aspects of this proposal, so that the Board and the community have something more than my explorations to go by. There are many other concerns and questions I have at this point, these include the present and future roles and thinking of those Toki staff members who don’t support the initiative, the way this all interacts with the recently approved Urban League program, how people at Toki came to champion Expeditionary Learning (and how much independent research have they done or looked at), why the “Equity” section of the administrative portion is blank …many, many questions and concerns. Plenty of time to air them; this is a long process. I want to close by saying that I admire those behind this proposal for working to improve their school, for not accepting the frustrations of seeing students struggle and fail, for taking the initiative to find a way to try to make things better. I may not end up agreeing that the way they have chosen is a good way, a way worth trying, but that doesn’t change my admiration. How does this EL model compare with Spring Harbor’s model? I know Spring Harbor has a project based curriculum where the project topics are explored throughout all subject areas simultaneously. The idea being to increase student engagement and allow middle school students to make connections and engage in higher level thinking skills as they explore the same project based problems across many different disciplines (i.e. English, Reading, Math, Science, History etc.) Spring Harbor’s model appears to require a lot more homework assignment time than students at Toki were given (at least 3-5 years ago when my youngest graduated from 8th grade at Toki). I will say the student engagement piece and the higher level thinking piece seems to have worked at Spring Harbor and students entering Memorial from Spring Harbor had a notable advantage over students entering from Toki (not sure about Jefferson middle school) the year my youngest was a Freshman 2010/2011. When changing a middle school design I would definitely seek input from 9th grade teachers at the high school. They are the ones that notice the different levels of preparedness and success and failure of students from the various middle schools. My youngest said a LOT of his freshman level teachers asked students what middle school they attended and then just give a knowing, “oh”, as if to say, that explains it!